Living Life to its fullest often means a full house. Even on those quiet days, I guess our home is full compared to many, but this weekend it was extra full – to the tune of an additional 16 gems, namely 8th grade middle schoolers, who whipped in like a hurricane for a Discipleship weekend organized by our church each year. Yes, you heard me correctly. Middle Schoolers. All weekend! Even though presently, we have a 13 year old daughter, so I am not removed from that age group AT ALL, how have I so quickly forgotten what a large mass of them together in one home for the entire weekend sounds like? Well, if you are in a one bedroom apartment, then no, this probably wouldn’t be the ideal scenario, but lest you think that I had rooms for all of them to sleep, think again. Yes, do you see our three boys? Smooshed on the floor in our bedroom, all our kids found a place to lay their weary head amidst the clean laundry that got stacked in mountains on our coach. It’s all about creative concealment when you have a large group sleeping all over your home. One of our teen boys had a friend come over and the only place for them to hang out was our bedroom. I looked at him before he entered and made him promise that he’d still love me the same once he entered the dungeon haven. Anything in our house that didn’t have a place was thrown into our bedroom for creative concealment issues. My main responsibility of the weekend was literally to just welcome, host, and feed, then feed again. I didn’t have to do any teaching, but I am a firm believer that feeding bellies is a conduit for feeding ones soul. Why are so many memories made around the dinner table? There’s something about food that draws people together and creates community. We relax and let our guard down which allows for conversation to flow. 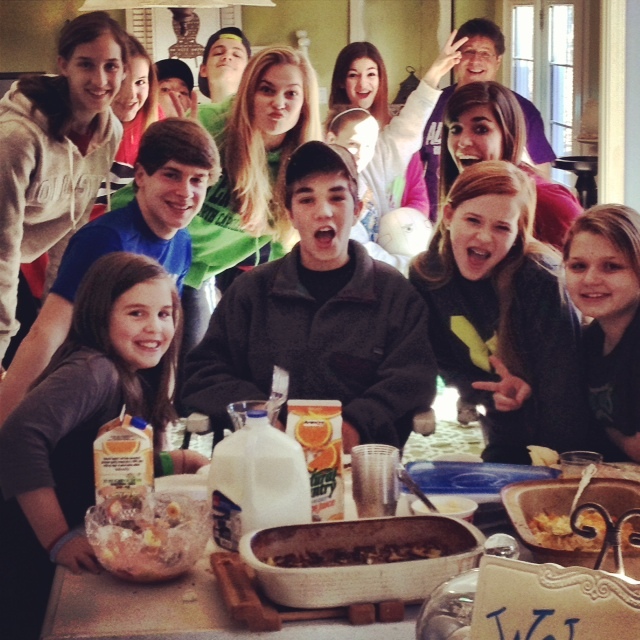 It was so cute because last year, we hosted 7th graders and this year, our group was 8th grade. One of the guys was placed at our house again and he was precious because he remembered all the food that I made. (Bummer, since I was repeating a bunch of the recipes.) 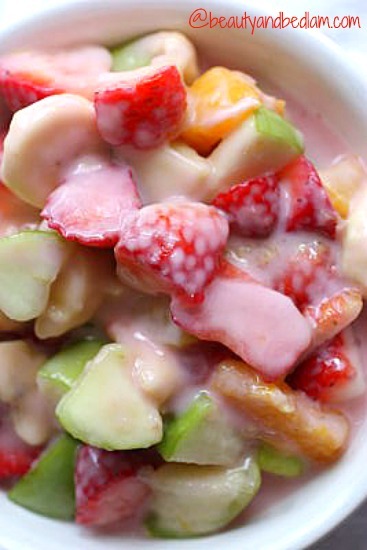 He kept telling everyone about how my fruit salad was his favorite and he had so many helpings. The most difficult part of the entire weekend was making all these favorite foods of mine while I am still doing my 17 day diet. My Hashbrown casserole and taco dip are my absolute favorites and I didn’t even eat a bite. That was painful, but it’s worth it. I am down ten pounds and determined to drop a few more before indulging. My Sausage Crescent Roll Recipe is always a hit for friends of all ages, and there are never any leftovers. Opening our home like this is about so much more than food. It’s about building community, making memories, and discipleship. It’s about modeling for our children that no one has to have a perfect house or five bedrooms to welcome strangers. It’s about realizing that when one gives out of little, even when schedules are full and bodies are completely worn out, the benefits multiply over and over again and the inconvenience is worth every minute. I pray these weekends reap eternal rewards. Hopefully, one new concept was introduced that will revolutionize the way these teens think of relationships, and that will affect future choices. 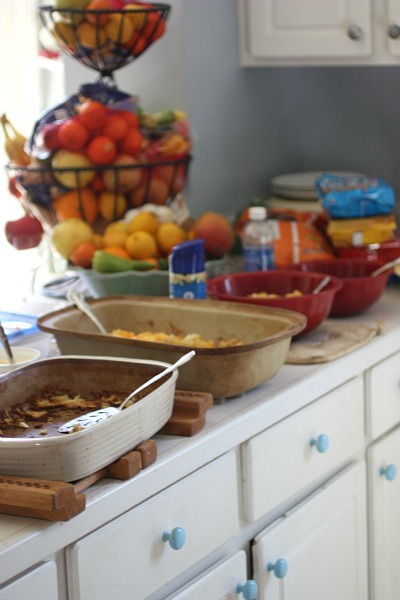 What are some of your favorite foods to feed a house full of teens? That looks like it was so fun! We also do tents in the yard and field around our house, grownups included…. 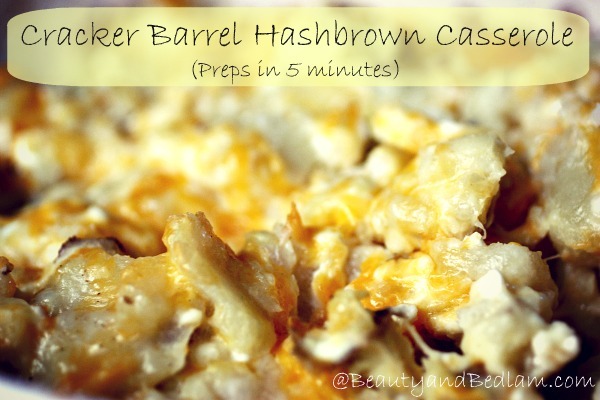 Carbs, anything in casserole dishes or that can be produced ahead or in a crock pot are ideal for lots of teens. For our daughter’s sweet 16 last year, we splurged on party trays from Costco. The kids danced ’til midnight out in the barn, and were still scarfing down everything in sight (veggies, fruit, sandwiches, everything!) right up ’til the end of the party. Sandwiches were perfect — finger food, no plates needed (though we had them earlier in the evening to accommodate the grownups), easy to make ahead. Next time, I think would just assemble the sandwiches myself, though it was totally worth it to have someone else cut up all the melon and pineapple. Silly question… Where did you get that fruit bowl I see in the background of the one picture? I can never find a bowl that I like that will hold ALL of the fruit we eat. That one looks awesome! It is such a HUGE double tiered thing, isn’t it? I always say, ” I need to get rid of it” because too often it looks like that and I keep thinking I should have “clean, cute, decluttered” counters and then reality hits. Where would I put it all? I got it from either Cosco or Sam’s a few years back on clearance. It had a wobbly stand and was like $7, BUT the good news is that I saw something very similar (a bit smaller) this past month, I think at Coscos (or Sam’s) for only $19.99. So worth every penny. Wow! 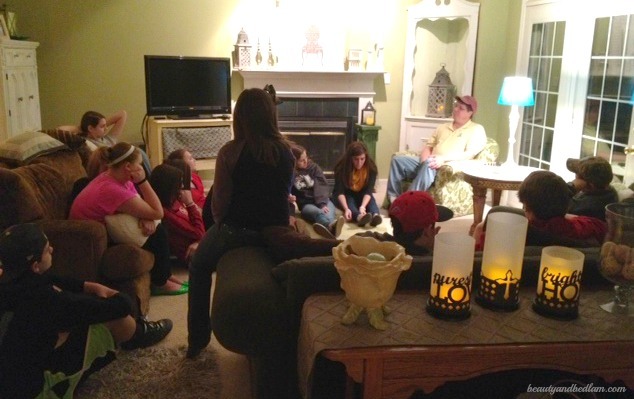 How awesome that all of those young people want to come together to pray and learn about the Lord! And how brave of you to host all of them, lol! 🙂 Thanks for hosting. I am sharing my homemade donuts. Hope you have a great rest of your week.